Foremost’s Darbi Rumpel has had to deal with cerebral palsy her whole life, a hurdle she has not let get in the way of becoming an advocate in the community for other special needs people. For her efforts, she won the Clarence Marsh Memorial Award at the Taber Legion during a ceremony in late January. The 24-year-old, who has resided in Taber Special Needs’ North Residence since 2015, was nominated by Edward Zaiser of the Southern Region Self-Advocacy Network (SRSAN) for demonstrating leaderships skills and promoting self advocacy in the community. She works at Taber Special Needs on the health and safety board, looking for fire hazards, and at the Berry Patch where she helps drop off clothes at the women’s shelter. Rumpel also sits on the Dynami social and fundraising committee where she recently participated in a making a recipe calendar, with two of her recipes to be sold as fundraiser items. “Happy, because I get to see everybody and talk to different people,” she said regarding her contribution to the community. Now that she has the award in her back pocket, she would like to build towards her future by working at an animal shelter, volunteering to play with cats and walking dogs, while trying her hand at the Movie Mill taking tickets. “I like movies, especially Mrs. Doubtfire,” she chuckled. 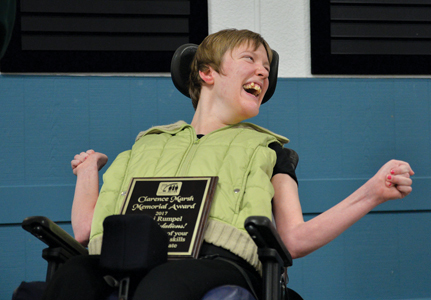 Rumpel had an honourable mention for the Greatest Kid in Alberta in 2013 and in 2010 she shaved her head to raise money for Cerebral Palsy Association of Alberta.